I can only hope the photo above provides proof to the contrary and lays to rest the persistent legend the venerable Hollywood Sign is, in fact, supported by the sheer strength of German tourists. 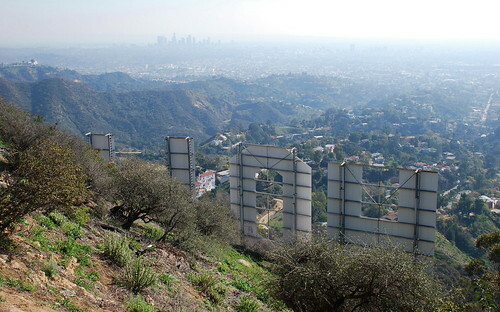 The Hollywood Sign was put up as the Hollywoodland Sign in the fall of 1923 to advertise the 500-acre real estate development of the same name down the slopes of Mount Lee. 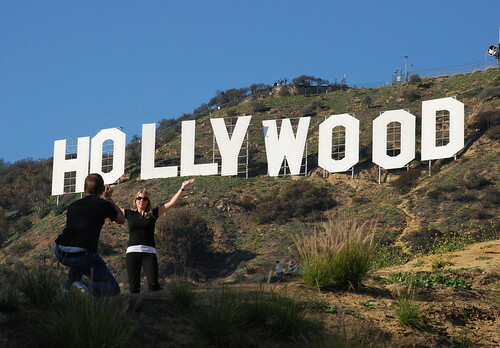 (The location of the sign was determined by an H placed earlier on the hillside by students from Hollywood High School.) The original tin sign cost $21,000 and was outlined with 4,000 light bulbs, which, at night, flashed HOLLY, then WOOD, then LAND, then all thirteen letters. (In a few vintage pictures, there’s a big white dot below the sign. I’d always think, “How can that same imperfection be in all these different pictures?” Turns out it was another light, thirty-five feet in diameter, which would flash after HOLLYWOODLAND. The award for what would be the coolest job ever as long as you only did it for a week goes to the sign’s caretaker who lived in a nearby shack. The guy would lower himself from the top of each letter with a shirtful of bulbs when it was time to replace them. In September of 1932, 24-year-old aspiring starlet Peg Entwistle leaped off the sign to her death. (Her launchletter was either the H or the latter letter D, depending on whom you ask.) She had been living with her uncle at 2428 Beachwood Drive. GET THIS: Peg Entwistle was born in Wales on February 5, 1908, one hundred years ago tomorrow. Happy 100th, Peg. By the time the city took ownership of the sign in 1944, it was already in advanced state of damage (the sign, not the city), and it was five years later when the LAND was taken down. Despite the ongoing disrepair, it wasn’t until 1978 that Hugh Hefner helped spearhead a full-blown restoration of the by-then city landmark. Donors, including Alice Cooper, Gene Autry, and Andy Williams, contributed $28,000 per letter for the new sign. Today, the Hollywood Chamber of Commerce owns and maintains the monument. Each letter is about forty-five feet tall and thirty feet wide, and, strung together, they stretch 450 feet. The sign weighs 480,000 pounds (lift THAT, German tourists!). The sign has been lit only a few times since the 1930s: upon its 1978 restoration; for the 1984 Olympics; and to usher in the year 2000. It’s also been given a few facelifts over the years, with the latest major restoration occurring in 2005. 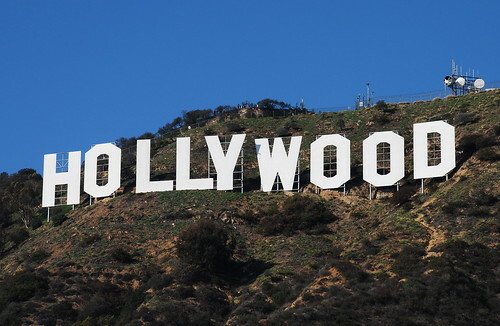 Finally, the sign’s been altered – officially and not – during the past few decades, including to OLLYWOOD, HOLLYWEED (twice), and FOX, which isn’t even close to HOLLYWOOD. And, check out this tres cool bonus! 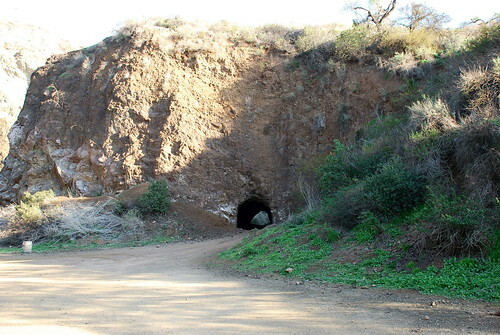 Closer to the end of Canyon Drive in Griffith Park, not far from the sign, you can find the original Batcave, which is pretty awesome. 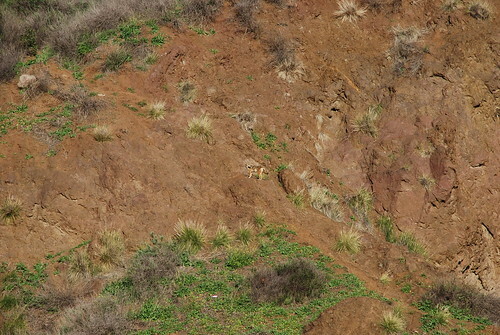 While taking the picture above, the fox below ran out in front of me, sped up the hillside, and studied me, mocking my hiking boots no doubt. 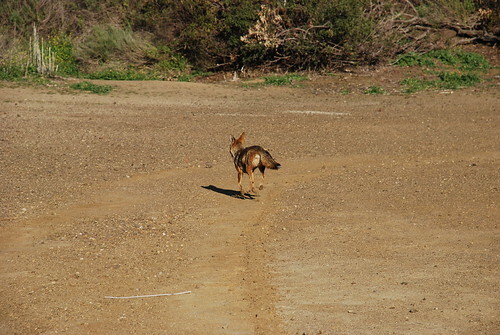 That fox is there, somewhere. 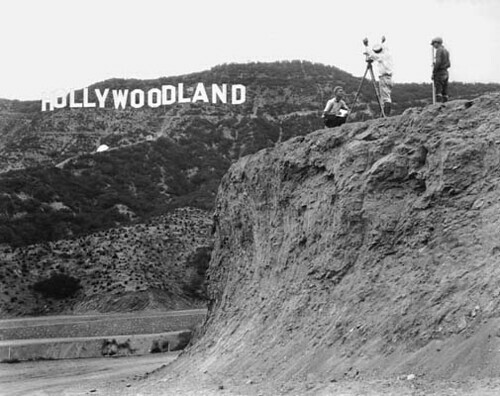 I used two sources for this post largely, 1992’s The Story of Hollywoodland by Greg Williams and the website for the Hollywood Sign Trust, a more exhaustive resource you won’t be able to find. how in the world did you get this close? We are taking the kids on a hike up there in a few days and I would love to get this close. Thanks, Michelle. There are a couple ways to get there. The easiest is to drive from Beachwood to Ledgewood to Deronda until it ends. Then start walking. 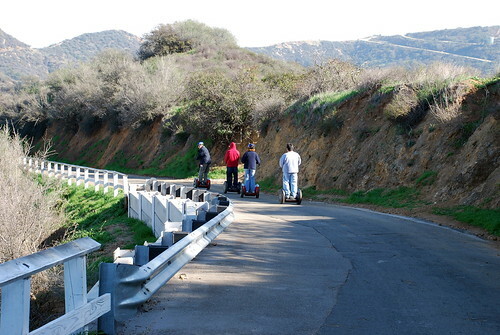 You can hike there from several places, like the Observatory, the Hollywood Reservoir, or my go-to, from the top of Canyon Drive. The last is two to three hours from the start and back. Have fun. Oh, I'm so glad to hear it's open. The last time I wanted to hike up there (which was a couple of years ago), it was closed for "security reasons" related to the reservoir. I'll add it back to the list. I bet it'll be a pretty hike this spring after all this rain!